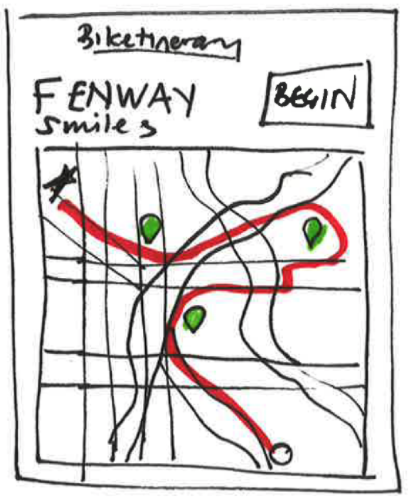 How might we help tourists take advantage of bikeshare networks to discover unfamiliar cities? Bikeshares have rapidly become more prevalent in cities around the world, and tourists increasingly view it as a quick, easy, and economical way to cover more ground. But navigating new streets and seeing the sights on a bicycle requires lots of extra planning, or a tedious ride of starting and stopping to check a map. Biketinerary is a mobile app and audio guide of curated tours based on a city's bikeshare network. Using GPS data, Biketinerary knows where its users are, helping to locate bikeshare stations and sites to visit, and mapping out biking routes. During the ride, the app measures the user’s location and velocity. Audio cues give her directions to navigate the city, and highlight interesting facts as she rides and stops at recommended points of interest. Transportation officials carefully plan where to install docks in their cities, based on traffic and the availability of biking infrastructure. Biketinerary takes advantage of this thoughtful planning. Depending on bikeshare networks also makes Biketinerary widely and instantly accessible, even to those who find planning to be challenging. Users can choose the starting point of their Biketineraries and end up wherever the Biketinerary takes them, or they can use the Loop feature, bringing them back to their start. This flexibility helps travelers discover new parts of the city, or return to things that might already be planned. Biketinerary users have the option to hear the full guided tour with interesting facts about the neighborhoods they’re riding through, along with navigation and bikeshare docking help, or just navigation alone. Bone conduction headphones make it possible for the user to hear her surroundings while using the app. Otherwise, users can stay safe by using only one earbud. When a user stops at a recommended Biketinerary site, the app will automatically bring up an information card allowing the user to learn more. When she continues on, the card is hidden and the map reappears. Our challenge was to present a compelling and novel product or experience through a prototype, video, and presentation. My team and I—all fans of biking—decided to focus on what’s missing for urban cyclists. We conducted research on the market of digital products related to cycling and found it to be saturated. After learning about how many products currently exist and are in the works for people who own bikes, we pivoted to focus on people who use bikeshare networks. In our research, we found a key insight: bike shares exist in more than 1,000 cities worldwide. We also learned about bone-conduction headphones from our instructors Josh Musick and John Leonard; with this new technology, listening to audio while biking allows users to still hear traffic and other sounds that help keep them safe. That’s when Biketinerary began to take shape. A tourist might land in a new city and see that there’s a bikeshare network, but be too overwhelmed and nervous to try to navigate the city by bike. Instead, she’ll choose to stick to walking, limiting the amount of ground she can cover. A more intrepid traveler might land in a new city, and decide to use the bikeshare network. But she’s still unfamiliar with the city, relying on a guidebook, maps, or other tools to help her navigate to sites she wants to visit. With Biketinerary, she sees a bikeshare station, along with an ad encouraging her to download the app. 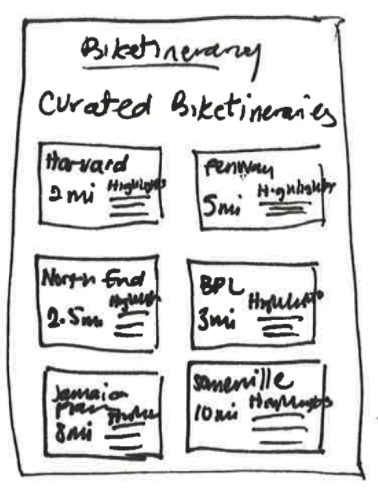 Once she opens it, she’s intrigued by all of the Biketinerary routes suggested to her based on her location. From the map thumbnails, she can tell she will be able to see much more of the city than she expected, and discover points of interest she hadn’t even been aware of. She listens to navigation help and essential information about neighborhoods and sites through her headphones, and more information to read in the app during her stops. Riding along confidently, she feels like she’s hitting the road like a local.